As seen in the Four Corners region between Tampa and Orlando, Central Florida remains one of the fastest developing areas in America. The population is projected to grow from about 7 million people now to 16 million people in 50 years. 1000 Friends of Florida's 2010 baseline maps out how the state looked at the start of the decade. This map is considered the "worst-case scenario" by 1000 Friends of Florida. President Paul Owens said if development continues at the pace it's at right now without proper management, this is what we could expect the state to look like by 2070. 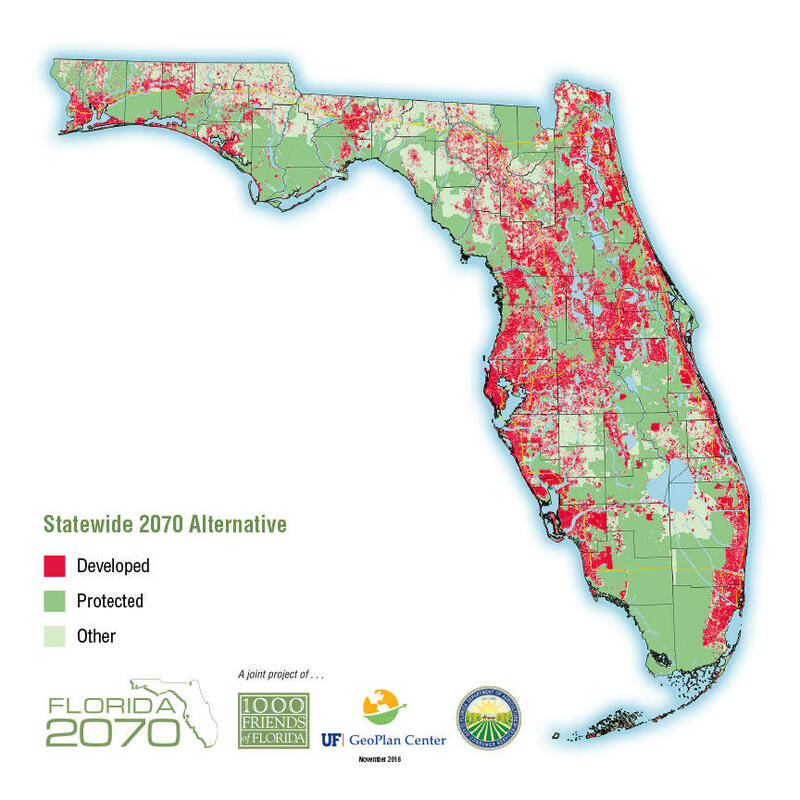 1000 Friends of Florida created this map to show an alternative scenario -- what Florida may look like in 2070 if proper steps are taken to manage growth and conserve environmentally-sensitive lands. There are similarities between the "alternative" map in the previous slide and this map created by the Florida Wildlife Corridor. The team wants the state to build green infrastructure so wildlife can safely migrate throughout Florida for years to come. The Florida Wildlife Corridor recently trekked through the Four Corners area in Central Florida on their Heartland to Headwaters Expedition to highlight how development is encroaching on critical areas for wildlife. A male Florida panther hunts on Babcock Ranch State Preserve, where the first female panther was seen north of the Caloosahatchee River since 1973. Carlton Ward Jr. cites this preserve as an example of developers and conservationists working together. Growth is no stranger to Florida. The state is a magnet for snowbirds, immigrants and sun-seekers. But will too much growth crowd out what people come here for to begin with? This week Florida Matters tackles the issue of balancing development with protecting the state’s environment and quality of life. WUSF reporter Steve Newborn hosts this episode to expand on a story he recently reported with the Florida Center for Investigative Reporting about the Four Corners area. This area of Central Florida is where Polk, Osceola, Lake and Orange Counties meet. Home to Interstate-4 and Walt Disney World, it has become a hub for development. The Florida Wildlife Corridor Expedition team recently chose Four Corners as the site of their latest trek, which was completed in April 2018. They wanted to highlight how growth in the area is threatening to cut off the Everglades from the rest of the state, which could pose serious challenges to water and wildlife. Carlton Ward Jr., renown nature photographer and co-founder of the Florida Wildlife Corridor, talks about those efforts. Ward has spent the past three years studying the Florida panther, an endangered species he said will remain endangered unless the state invests in more land conservation. Paul Owens, president of the environmental group 1000 Friends of Florida and opinions writer with the Orlando Sentinel, also joins the discussion. 1000 Friends of Florida recently published its Florida 2070 Report, which maps out potential future scenarios for the state depending on how population growth, development and conservation are managed in the coming decades. This first map depicts Florida in 2010 and serves as a baseline for future projections. Green areas are protected lands, while red areas are developed. 1000 Friends of Florida created the map below to show what Florida could look like in 50 years if development continues at its current pace without proper management. About half of Central Florida could be paved over by 2070 according to what the group calls the "worst-case scenario." But the group said the map above doesn't have to be Florida's future. 1000 Friends of Florida created a second map to show an alternative scenario, one that involves responsible development over the next several decades and conservation efforts. The plan involves “smart growth” – how efforts like urban infill and building up instead of out could potentially benefit developers and conservationists alike. For developers, higher density projects could make it easier to turn a profit than by building large single-family homes. And if they work with conservationists to protect land on their developments, panelists said everyone wins. However, the panelists said limits need to be put in place so as not to tarnish traditions in communities that may not want to knock down a historic home to build a skyrise apartment building. Paul Owens said growth management is an economic issue as much as it is an environmental one. He argued Florida's tourism industry could suffer, as could its current economic boom, if traffic congestion and unattractive scenery destroys the Sunshine State's quality of life. WUSF invited representatives from local development companies on the show, but none could attend. Florida Matters is now a podcast, it's another great way to listen whenever it's convenient for you. Find this week's podcast here and subscribe for future episodes. Looking from atop the ridge at U.S. Highway 27 as it follows the sandy central spine of the state, you can see brand-new red roofs roll in waves down the hills to Interstate 4.